Wayne Wesley Johnson is a professional Award Winning Guitarist who formerly toured with guitar legend, Les Paul, recorded and performed with Nokie Edwards (The Ventures), and others, and has performed with Mason Williams (Classical Gas). He has sold over 80,000 CDs worldwide and his music is heard Internationally on over 400 radio stations and on Roswell, Malcolm in the Middle, Discovery Channel, Outward Bound, MTV's Made, and the Weather Channel to name but a few. He has toured and performed all over the world including China, Israel, Europe, South America and in most of the 50 states. aijai Jackson of The Jazz Network Worldwide - Prweb.com Featured This Week on The Jazz Network Worldwide: Guitarist Wayne Wesley Johnson launches website and his new single “Ticklestick”. Wayne Wesley Johnson launches innovative website sharing his internationally recognized award winning world-class artistry showcasing his new single “Ticklestick” off his upcoming remastered “Jazzmenco” recording. This charismatic performer has shared the stage with some of the world's finest guitarists. Formerly a drummer and touring companion with legendary guitarists Les Paul and Nokie Edwards (The Ventures), Wayne has also shared the stage with Mason Williams, George Benson, Bucky Pizzarelli, BB King, Scotty Moore, Howard Roberts, Larry Carlton, Chet Atkins, Thom Bresh (Son of the legendary guitarist Merle Travis), Tom Doyle, Ruben Romero, Antonio Mendoza, Tommy Emmanuel, Seymour Duncan, Stephen Bennett, Stephen King, Richard Smith, Anthony Smith, Tim Farrell, Edgar Cruz, Lou Pallo (The Les Paul Trio), Jon Paris, and more. His current single,”Ticklestick is a tune written many years ago but only recorded recently. Wayne is joined by guitarists, Edgar Cruz & Lou Pallo (Les Paul Trio), bassist, Jon Gagan (Ottmar Liebert's Luna Negra Band), and drummer KC Morris on this track. Ticklestick represents a fusion of guitar stylings by Wayne, a fusion of driving rhythm guitar (Lou Pallo), and a memorable melodic theme performed by Wayne and harmonized by his friend, Edgar Cruz of Oklahoma. Ticklestick has already enjoyed several months a #1 on the charts at KJazzRadioUK.com and was a finalist in Best Jazz and Best Instrumental Categories at the New Mexico Music Awards. Wayne invites you to enjoy this newly remastered version of Ticklestick available at CDBaby.com and from digital music providers. 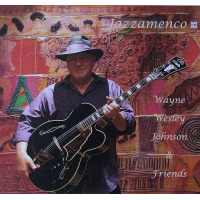 Though initially released as a single, the tune is one of the bonus tracks in the upcoming Wayne Wesley Johnson and friends Jazzamenco double album a compilation of Wayne's finest and recently remastered recordings to date which features his guitar mastery and pioneering jazz/nuevo flamenco fusion stylings supported by various guest artists including the late classical/flamenco guitarist, Ruben Romero. Ticklestick will also be on the soon to follow Summertime in Santa Fe Project produced by Wayne, which also includes in addition to WWJ, Edgar Cruz and Lou Pallo, performances by other guitar greats, Thom Bresh (Son of the late Merle Travis), Tom Doyle (Les Paul), Tim Farrell and Anthony Guitar St Smith. “I have had the pleasure to work with many artists throughout the years by way of The Jazz Network Worldwide. I pride myself on finding artistry that deserves to be heard, recognized and honored for the artistry they possess. Wayne Wesley Johnson is a focused hard- working musician who finds another layer of his musicianship each time he plays, such a vast musical landscape he encompasses. His business acumen is top draw and his vision is endless. I so much enjoyed not only listening to his music and designing his website for him, but listening to the story of his life. This man tells his story through his fingertips directly to your hearts”, Jaijai Jackson, The Jazz Network Worldwide. In addition to his concert, corporate and private performances, Wayne is New Mexico's Premier Wedding Guitarist, in high demand for both ceremonies and receptions, as well as special events around the city. Branching out, Johnson is seeking worldwide stages that compliment his style of performance from smooth jazz, jazzmenco, and jazz standards. He is currently serving as a Member of the Board of Directors - New Mexico Jazz Workshop. ‘Be sure to check out his new website at http://www.waynewesleyjohnson.com and his feature at http://www.thejazznetworkworldwide.com. *Your musical magic made it a wonderful day for all of us, Wayne, thank you! We look forward to next opportunity, hopefully with Mito. *Wayne is a true guitar aficionado, he is a collector, designer as well as a fine player. His recent collaboration with Ruben Romero (Hypnotic Safari, avail. at Hallmark stores everywhere) is a unique blend of jazz, classical,and fingerstyle with a rumba rhythm Wayne calls it Jazzamenco. Wayne is multi- talented and has toured with the legendary Les Paul as a drummer and has also sat in on drums with Nokie Edwards of The Ventures. Wayne has several Leach guitars: Rachel (with Willoughby cut-away), Franconia, a 16 Archtop and Jurassic Guitar and has a Bresh Spirit too. Wayne has also had a great effect on Leach Guitars, his subtle design hints into what collectors see were invaluable, as was his networking( several of the endorsers on this page were met through Wayne). Harvey Leach - -H.G. Leach Guitar Company Grass Valley, CA. All About Jazz musician pages are maintained by musicians, publicists and trusted members like you. Interested? Tell us why you would like to improve the Wayne Wesley Johnson musician page.